There has not been an official announcement yet, but page 9 of the March/April 2019 issue of N-Scale magazine has an ad for JTC 48-foot corrugated containers. I am going to need a lot in the two APL paint schemes shown. "For the modeler and collector of 1:160 scale model vehicles and equipment"
A welcome addition to the intermodal fleet for the late 90s era and later modelers. We're pretty blessed in N to have @JaxTerminal consider this prototype in N and I hope it's well supported. It was ordered in large numbers by APL / Pacer Stacktrain and represents the start of the transition to the great 53' steel fleet of the 2000s. These were prevalent on the UP out west but other roads include Flexi-van, NACS, CSX and Sea Star. More containers are always welcome although I've got entirely too many already. My modeling is based on the UP mainline through southwestern Idaho and southeastern Oregon in 2006. 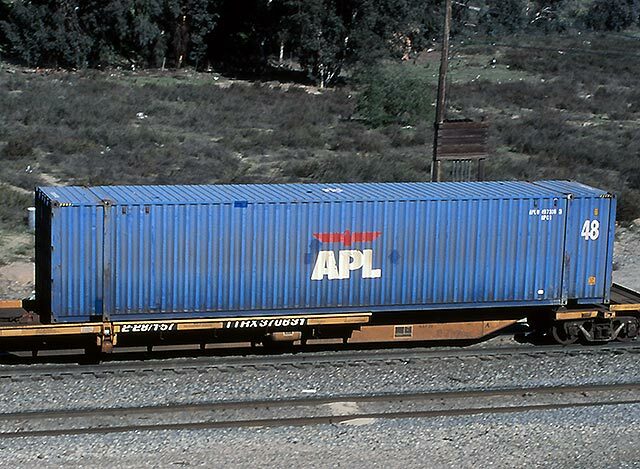 The blue APL 48-foot corrugated containers are essential if one wants to have a realistic looking stack train with domestic containers within that time frame. Needless to say I was very happy when Steven indicated that JTC would consider making 48-foot corrugated containers. And to add to the paint schemes James listed, I have found photos of blue Pacer 48-foot corrugated containers. The paint scheme appears to be very similar to the paint scheme found on Pacer's 53-foot containers. Well, I'm sold at least on the Pacer, which I once saw in the wild. What is the reporting marking on the NACS/ex-Flexivan? It's a bit too interesting to pass up, but I don't recall ever seeing a photo of those. These are really good looking, I'd get them all except for budget and they're kinda rare prototypes. The NACS /Flexi-van markings are based on NCGU - Genstar units. In conjunction with the release of the JTC 48' APL containers, we have created a brief History of APL, condensed from several sources (Wikipedia & corporate websites). We hope that you find this interesting and informative. It can also be accessed through the JTC, APL Series, web page.